Why is Lagos called Las Gidi? | Juliet 'Kego's World of Floetry; Explore! Experience! Enjoy! Tag Archives: Why is Lagos called Las Gidi? Random Musings: Why is everyone in such a hurry in Las Gidi? Juliet 'Kego Ume-Onyido	. Poetry4Change Africa, Random Musings	. 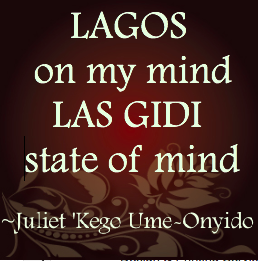 Go slow in Lagos, Lagos Fast Lifestyle, Lagos traffic, Las Gidi State of Mind Poem by Juliet Kego Ume-Onyido, Life in Lagos Nigeria, Why is Lagos called Las Gidi? “Abegi, commot for road make we pass”, “Hurry, my brother, quick, quick”, “I have to use someone else, you’re wasting my time”, “Abi you no sabi drive?” “Time is running out, let’s go”… a mashup of disjointed, impatient conversations. The cars trapped in traffic, drivers honking their horns in a jam. And low, behold, as I pay attention, the noise has a hidden symphony, a rhythm of mingled greed, dreams, hopes and despair. There’s the loud wailing and silent sobbing, the raucous laughter of a deal gone through, the jocular slap of an Oga to a good praise singer….